Finally the crows are back – winter or not. Also, I have seen several Rough Legged Hawks and, to my surprise, a lone Bald Eagle perched in a tree along the highway. To date I have not seen any robins nor bluebirds. Even the juncos are not back yet. However, they all should be here soon. 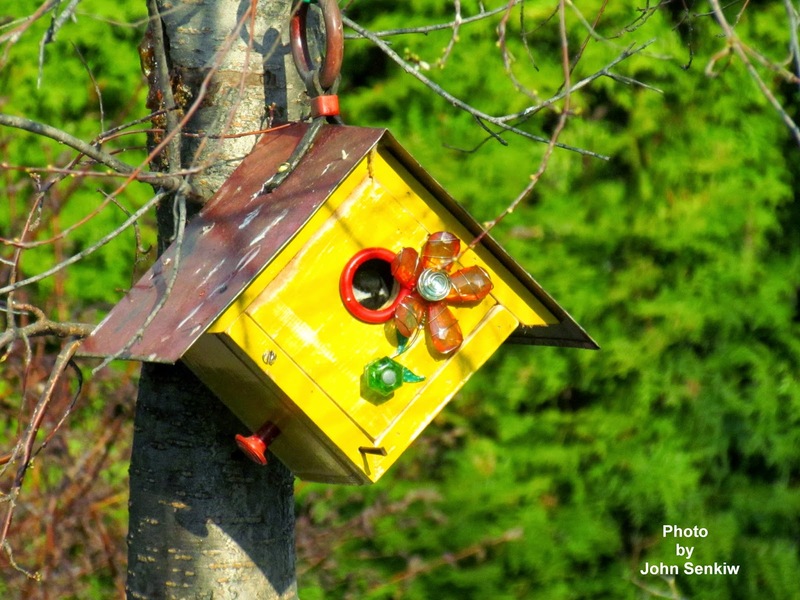 In any case it is that time of year when bird fanciers should be thinking of putting out birdhouses for the spring nesting season. This is especially true if one has to build new houses for whatever reason. 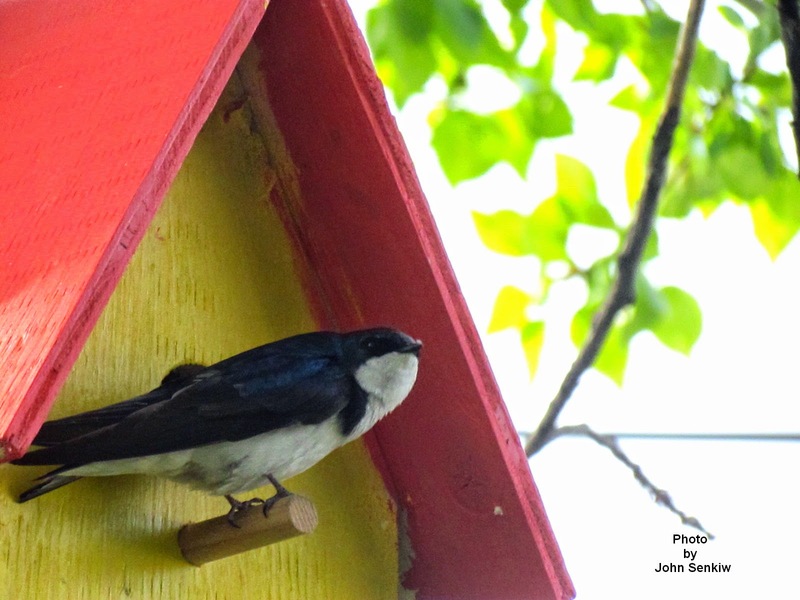 Existing bird houses require much less time even if repairs are necessary. 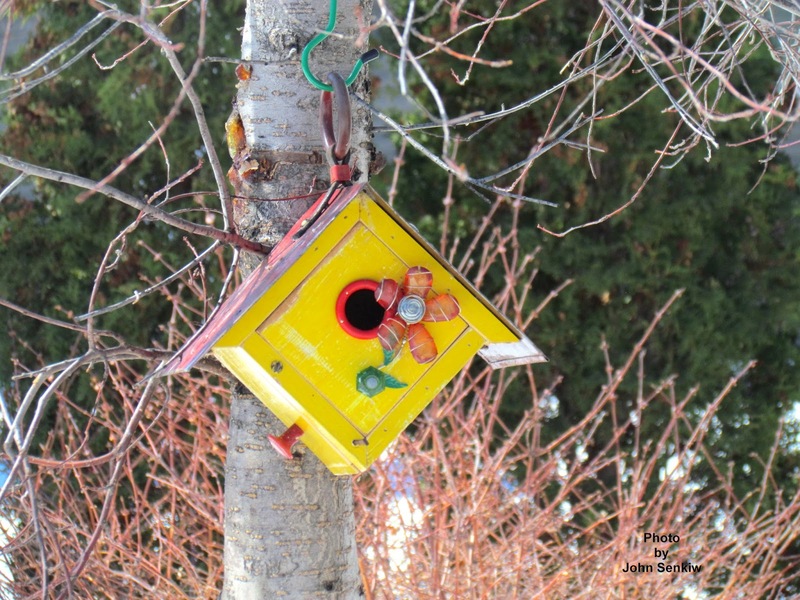 Bird houses that have been occupied in previous years require very little effort to make them ready for the upcoming spring. 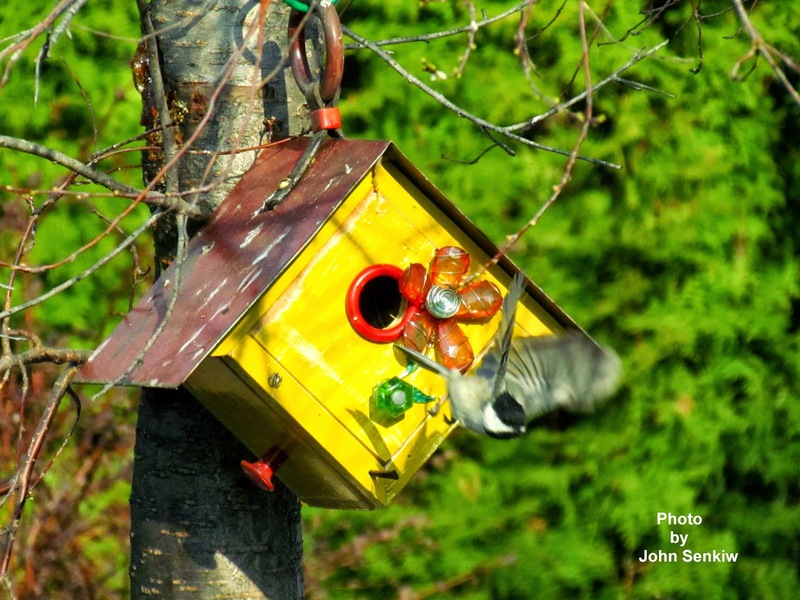 Some people feel that it is necessary to clean the bird houses every year. If bird lice are a concern one need not worry. Bird lice require a body temperature of nearly 40C to stay alive. Even human body temperature (36C - 37C) is too cold. Our frigid winters completely sterilize the nests. One always has to keep in mind that all cavity nesters used to nest in abandoned woodpecker nests and nobody went around cleaning out those nests. We cannot and perhaps should not apply human standards to birds. They are not people with feathers. After all they drink out of mud puddles. 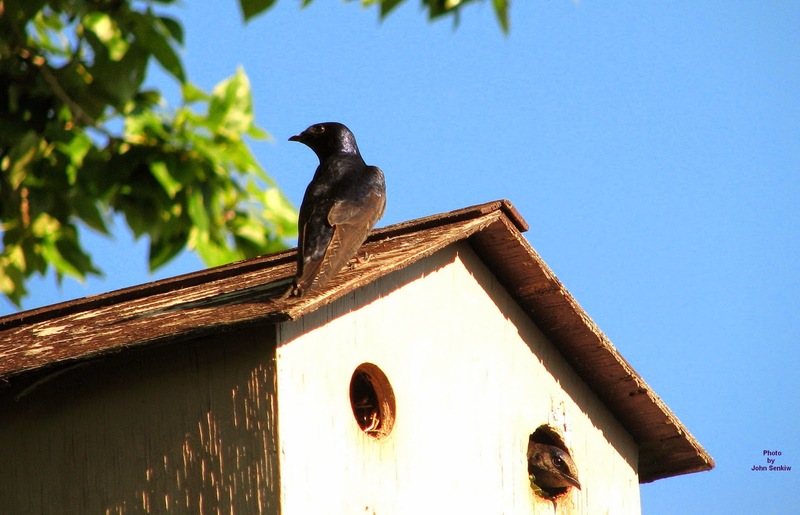 For new bird house construction I will start out with the most common and easiest bird house to build. 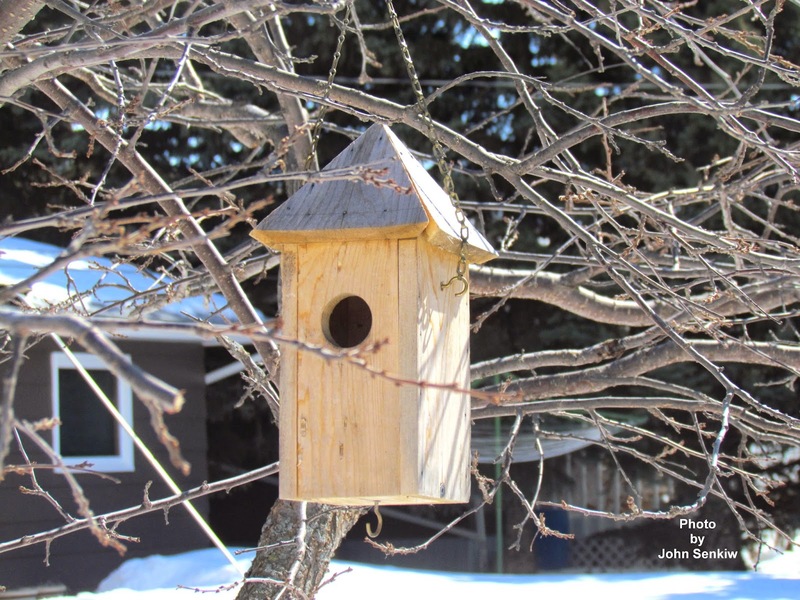 Of all birds the House Wrens are the least finicky about their bird houses and most easily satisfied with anything that remotely resembles a bird house. Dimensions can vary from 4” by 5” to 8”by 10” and everything in between. A one inch hole is the perfect size as it allows the wren to get in and out of the house but excludes all other birds – especially House Sparrows. The most common material is wood – usually scrap wood. Wooden houses should be painted to preserve them. 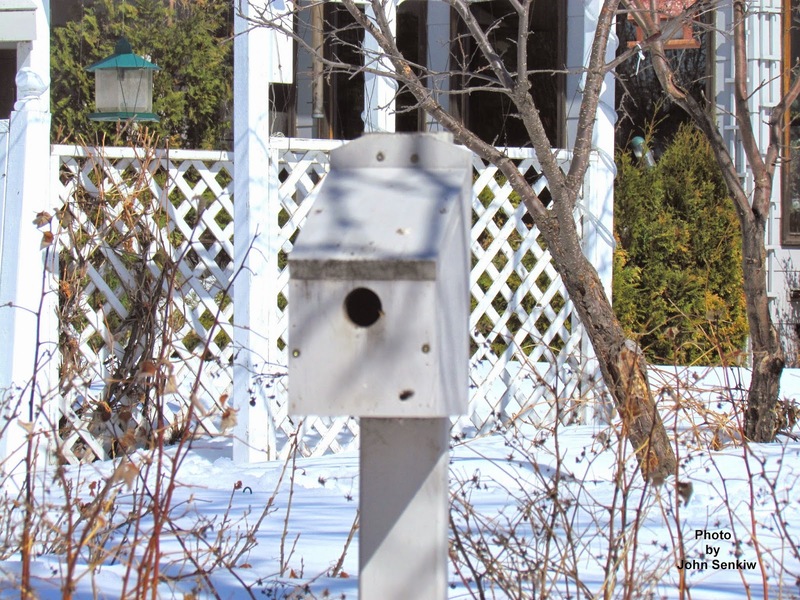 Many commercially prepared bird houses are made of lightweight aluminum. Aluminum is very good as it does not absorb heat and remains cool throughout the hot summer days. Even larger steel(tin) cans can be used. As kids my brothers and I would punch one inch holes in tobacco cans and tie them to trees. They were always occupied by wrens. Steel cans will heat up to dangerously high levels so care must be taken to mount them in good, day long shade. The houses can be as fancy or as plain as one desires. Either way the wrens will be perfectly happy. It should be noted that wrens spend a great deal of time on the ground and therefore need good ground cover for protection. A yard without shrubs, flowers and so on will make it very difficult to attract wrens. 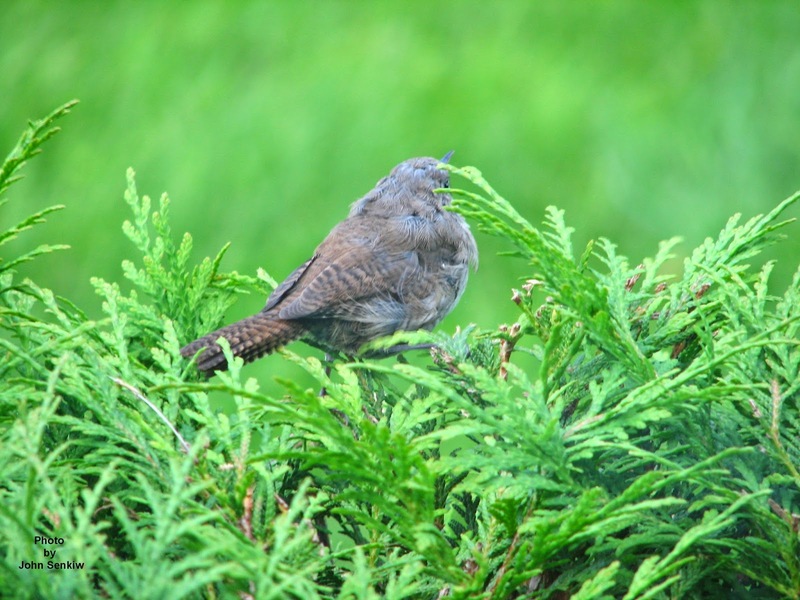 This week’s picture of a wren on a dwarf cedar was taken just outside our solarium window. The bird houses are of the three we have in our yard. The dark (brown) house (no photo) is in our front yard and has had wrens almost every year since we put it up about 20 years ago. The colourful one that we purchased last year stayed vacant. 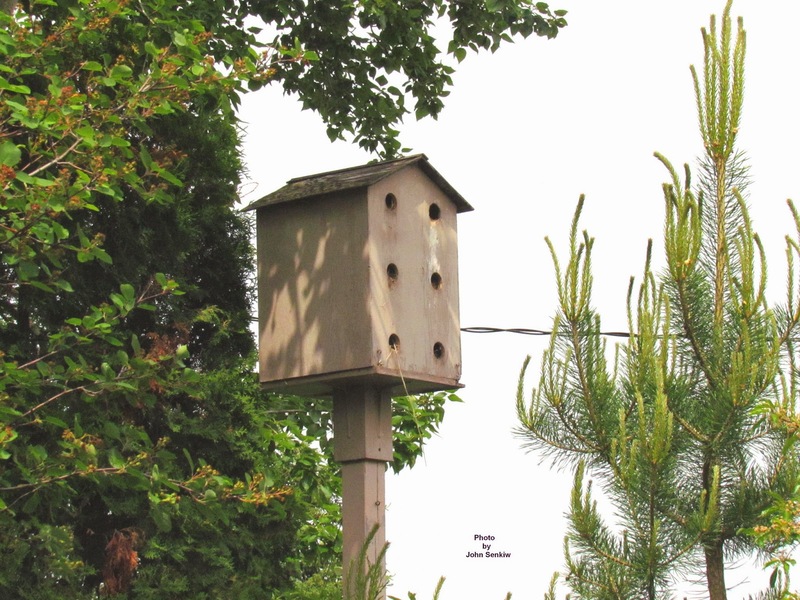 The hanging house was set out two years ago in our back yard for Tree Swallows but a wren beat them to it. I never got around to painting this house – maybe this spring.